When you stop to consider the various story lines that were running prior to the massive cliffhanger Arrow left fans on before it went on hiatus for the holidays, the manner in which 'Blood Debts' conducts itself is far more understandable. It doesn't necessarily excuse the fact that the reveal of Felicity's fate didn't ultimately land with the sort of impact something of that nature typically would, but from the standpoint of getting the audience back into the bulk of the season's storylines and opening the door for the ramifications of Felicity's paralysis to be explored more gradually, it has a sort of graceful TV logic to it. There is relatively little to talk about regarding Felicity, since the midseason premiere spends the bulk of its time with Oliver, watching him "go off the rails" again. What's surprising is how that approach to the narrative of the episode puts the focus almost entirely on him and his point of view. Sure, there are the usual subplots that are typically found in your average episode of Arrow (there's even time to see the tattoo given to Oliver by Constantine glow in the island flashback), but, by and large, 'Blood Debts' is an Oliver-centric piece of the season 4 puzzle, one that tells a, by now, fairly standard story about the character's struggle to retain the humanity he had once seemingly abandoned and subsequently worked so hard to regain. Aside from the oddness of the presentation, and the choice that is made to have it come mostly from Oliver's perspective, the episode itself isn't necessarily a poor one. All the pieces actually fit nicely with one another, matching Diggle and Thea's struggles with Oliver's actually serves to bolster all three. Perhaps the only real weak point is Laurel is once again used as a plot device: arresting Anarky, a.k.a. Lonnie Machin when Oliver wants to question him and forcing the Green Arrow to make a choice that could potentially put innocent people in harm's way. This isn't the worst storytelling sin the show has made when it comes to Laurel, but her character being used to facilitate a point so blatantly speaks to how the seams of the episode were generally showing the entire time. What worked did so in smaller batches. Diggle's physical approach to interrogating his brother yielded no results, so Lyla's guidance, that perhaps the way to reach Andy is through a display of brotherhood, winds up not only furthering the quickly stagnating plot of Andy being held prisoner, but also Diggle's connection with Oliver. It's a handy way to get Ollie back on track after he understandably gets a bit of tunnel vision and winds up letting his narrow-mindedness put innocent lives at risk. Diggle opting to tell Oliver he supports him, rather than hit him with a lecture, is a refreshing change of pace, especially considering how tremendously familiar Oliver's actions and his frame of mind felt for so much of the hour. Thea, too, struggled (or continues to struggle) with certain aspects of her humanity, and while Machin has been off the Arrow radar for quite some time, their interaction here not only underlined her season-long arc, but also demonstrated the way in which these characters always have a choice as to which path they want to take. It's a fine line most of the time – one that's made more precarious when your weapon of choice is a razor sharp projectile that is designed to be lethal – but here, Thea's ongoing issues with her bloodlust highlight just how difficult that choice can sometimes be. Sure, there is something of a built-in narrative loophole, in that Thea is burdened by what is ostensibly a supernatural force, whereas Oliver is fueled by a need for good old-fashioned revenge, but the narrative parallel still works, and still strengthens an episode that could just as easily have gone off the rails like its protagonist temporarily did. And yet, it's that focus on the protagonist that makes 'Blood Debts' such an oddly focused return. 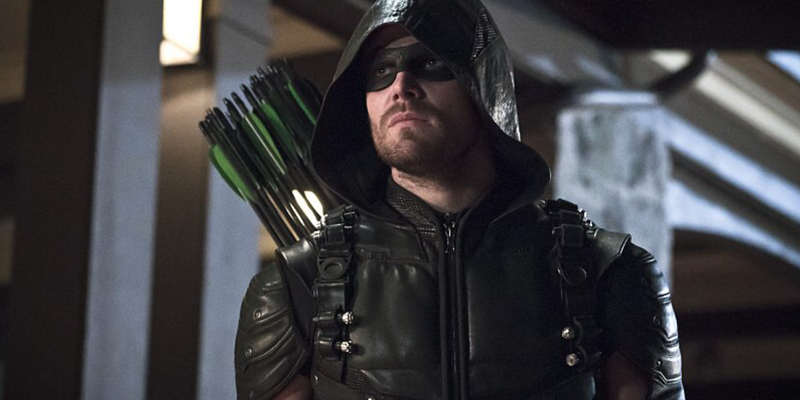 Arrow is primarily about Oliver Queen, but it relies so much on its supporting cast that when something life altering happens, like learning Felicity has irreparable spinal damage (inasmuch as anything is irreparable in this universe), and the bulk of the attention paid to that tragedy is the impact it has on Oliver, is conspicuous. Of course this isn't a thread that is just going to be dropped next week; the ramifications of what happened to Felicity will likely be felt and explored for the remainder of the season at least, but to start that exploration by pivoting away from the individual struck by tragedy feels a little like getting off on the wrong foot. That decision is made more apparent when Arrow bookends the episode by flash forwarding four months to Oliver standing graveside vowing to kill Damien Darhk. The show makes a point of showing that Felicity isn't the one who died. But reminding the audience of a plot point from the beginning of the season doesn't necessarily make up for how it kept Felicity's fate at arm's length. Felicity's paralysis suggests the stakes have been raised, and there was a nice exchange between her and Oliver in which he returned the engagement ring to her finger, reinforcing the idea that, although they have their detractors the two actually work as a couple, but the interplay came across as though it was designed to reassure Oliver more than the woman whose life has been irrevocably changed. It was an unorthodox way to get the season going again, but the peculiarity of 'Blood Debts' came with one distinct advantage: the episode didn't lack for drive. To that end, the hour may have sacrificed (or simply delayed) the introspection Felicity deserves, but it did so to get its story threads lined up. There are worse sins for a television show to commit when returning from hiatus, so, in the long run, although it missed the mark in terms of servicing a particular character, Arrow at least shot straight at the heart of the season's plot.